Our Medium is OUT OF STOCK, but we have ordered more! You are still able to purchase it now and we will ship it to you as soon as it arrives. Questions? Please call 1-800-438-5346 or email us at info@Lehmans.com. 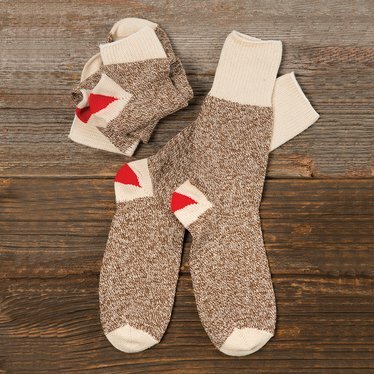 A couple pairs of these rugged socks will see you through seasons of hard work, indoors or out. (Or, sew your own piece of Americana: the legendary sock monkey.) USA made for over a century, the Rockford® red heel was introduced in 1932 to set them apart from all others. Still recognized as top-quality work socks, they're tough enough for outside jobs but just right for cozy evenings by the fire, too. Midweight, they fit comfortably in boots while keeping your feet warm and cushioned. I bought these for my kids and myself as something fun to wear. They are of average thickness, so I wear them everywhere, even to work on casual days. And they're made in USA too! I gave these as an XMas gift to my difficult-to-please daughter, who as expected gave them a stony look and said, Oh, socks, as if I'd given her a fresh turnip. Then I pointed out that these were *official* Sock Monkey socks, and her expression changed instantly! Who says US-made cotton socks have no bling? My feet always get cold unless I have shoes on. Not anymore! These socks keep my feet warm and are very comfortable! I purchased 2 sets of socks. Very good quality, but I was expecting them to be a little bit heavier in weight. But I am very satisfied with the look and the quality. My husband really likes these socks. He said they would be perfect if they were available in a light color, and if they were a little bit looser (nerve pain in feet).